My family was not religiously interesting. We weren’t born into anything like Catholicism or Judaism or even Mormonism. We were the great American religion known as “On Again, Off Again”. As a child, I was never sure what inspired the On portion of this exercise. I suspected it had some origin in my parents’ desire to have a peaceful Sunday morning. Church, for them was a nice break, since we were the ones required to go. When I was in upper grade school, we went to a little broken down church a few miles down the road. It was run by an older couple, who I’m pretty sure had no real churching experience or credentials. The building itself was run down, apparently had no heat source and smelled like mold and moth balls. There were a few of us neighborhood kids who’s parents needed an hour or so to themselves on a Sunday morning. The girls down the road from us were on the same random church schedule we were. It almost felt like a social thing. But not quite. There was no playing. No dancing. No talking. Yeah. Not really anything like a Social. But it was comforting to walk in surrounded by your posse. Even if your posse was a group of elmentary school girls between the ages of six and ten. Sunday morning church misery would have been hard to face alone. My mom would load my sister and me into the car, pick up our friends on the way, and then slow down just enough that we could jump ~ or be pushed out of the car in front of the church doors as she sped away. We were kind of a ratty looking bunch. Baths weren’t given until Sunday night, so we were about a week overdue by the time the church bell was ringing. The five of us girls were always ushered to the front row of pews by the Pastor’s wife. She was not much taller than me and looked as if her bath was still a few hours away, too. Her hair was dark with grey streaks and hovered precariously in a bun that wasn’t very well thought out. I always felt we were being scrutinized by the congregation as we were walked to the front. It was unclear what they were looking for or if they were satisfied by our attendance. As Mrs. Church Pastor seated us in the empty pew, she whispered “Here we are” over and over. Before she scurried away, she’d slip a Brach’s jelly nougat in each of our sweaty, little palms and pat us on the knee. I don’t recall one single thing about church past that jelly nougat. I sit here and wrack my brain for some memory of the type of sermon he gave and I get nothing but the memory of jelly nougat. The sound of the cellophane wrapper as I unwrapped it, and the bits of hardened nougat that flung off the aged candy onto the blue grey carpeted floor. 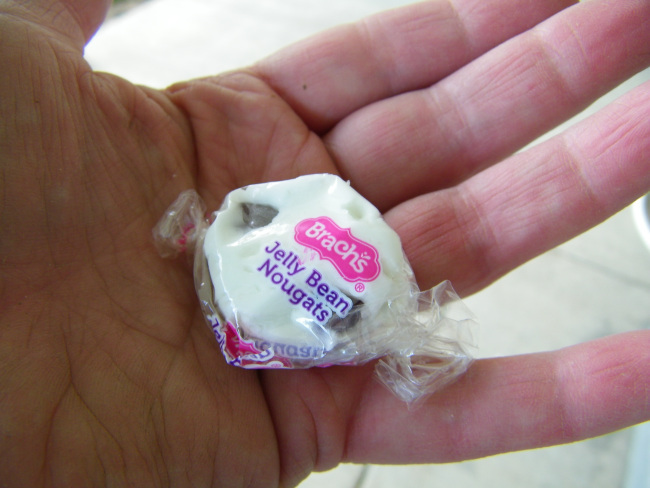 But today, as I passed the Brach’s bin at my local grocery, I saw the white candy with the colorful blotches of jelly, and thought… Ah, the taste of Church.